I am six days out from my first race of the season – a sprint triathlon at Smith Mountain Lake here in Virginia. We get a lakeside cabin for the weekend and make a little family trip out of it. So in addition to me getting ready, I’m planning, packing, and prepping food for the whole weekend because there are few nearby dining out options. I have a lot of friends racing so I'm glad for that. Before I plummet head-first into the busy-ness of the week, I thought I’d take a moment and gather my pre-race thoughts. I probably need to re-read my own post on Why Do You Race? 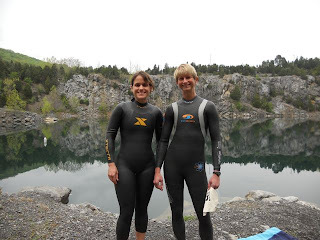 Last year this race was my first in a wetsuit (second race ever - here's that race report). I had a bit of a freak-out then probably from the cold water temp (which wasn’t THAT cold really) and the weirdness of the wetsuit. I broke into some breaststroke/backstroke and was really mad at myself. I’ve made some significant progress in my swim in the last year thanks to lots of help from Coach and consistent work. Plus that was nearly all I could do for 10 of those weeks. I have to expect that will carry through at the race and take that confidence with me. 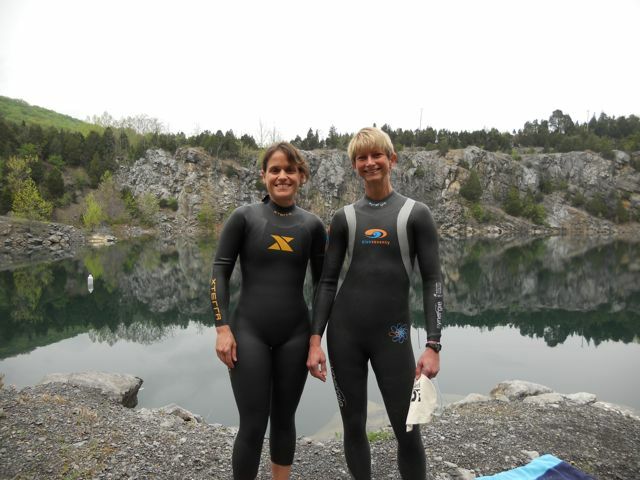 Today I went with two friends to a nearby quarry and we took our wetsuits for a test run. It was 55 degrees. And raining. So we felt like tough girls after a few laps through the cool water! Tell myself: Stay relaxed, focus on my stroke, draft when possible, and swim straight! Ooh, I need to brush up on my mount. I do the shoes-already-clipped-in, feet-on-top method. Remember to have it in the right gear. Tell myself: Move quickly but carefully, be safe. I am not where I was a year ago, and I don’t expect to be, thanks to my layoff and only being back on the bike for 8 or 9 weeks. The hills are a little tougher and the quads burn a little hotter. But I still feel smooth, the bike is running smooth, and I know what I need to do here. Put the pedal to the metal and GO baby! Sprint distance, no letup, just GO. Tell myself: Suffer. The race goes to he who suffers most. Yup, I need to brush up on my flying dismount too. I love doing those!! Then put on shoes, grab the hat, watch, and race belt, and finish the job! I’ve had some issues with getting negative on the run even though I have often been one of the stronger female runners. This seems to happen when I get a predetermined pace in mind and I see I am falling short. I need to remember that race day conditions, my own physical and mental state, energy expenditures on the bike, and terrain can all have a significant impact on run pace. I need to be smart, go out conservatively, and finish strong. I also need to better manage the negative thoughts and run within my own capabilities. No fear! Tell myself: Focus on cadence, relax, and save the afterburners for the final mile. Stay positive!! Smile at the finish line so you don’t look the way you feel (suffering) when the race photographer snaps your picture. Tell myself: You did it, girl! Transition back from triathlete to mom. Make lunches, clean up, play, serve…..
Tell myself: You are blessed.